How to Correctly Measure a Full Lace Wig or Lace Front Wig Correctly if the Size is Big? Human hair lace wigs offer realistic looking hairstyle with a mesh lace base beneath real human hair. In order to wear a lace wig with confidence, you will first want to be absolutely certain the wig is the right size for your head. An oversize lace wig not only looks strange, but also may be more vulnerable to falling off. You can avoid embarrassing lace wig moments by measuring your head before you purchase a lace wig from seller or hair products factory. With the right measurements, you’ll get the most appropriate lace wig and comfortable feeling when wear it. Things to prepare:Hair pins,Tape measure,paper. 1.Pin your hair down as tightly as you can. You need to measure your head, not your hair. Keeping your hair flat on the skull gives you a more accurate reading data. 2.Measure your head's circumference by running the tape measure around your hairline. Start at your hairline directly above the middle of your forehead. Bring the tape around the back of your head, following the hairline, and end back at the same spot on the forehead. Write this measurement down on paper. 3.Place the end of the tape measure at the point where your hair meets your forehead, directly in the center of the hairline. Run the tape straight back over your head and down to the nape of your neck and write the number down on paper. 4.Run the tape measure from the base of your left sideburn (just in front of your ear) along the hairline over your forehead and back down to the right sideburn. Write the number down on paper. 5.Take another ear to ear measurement, this time from the top of one ear and directly over the top of your head to the top of the other ear,write the number down. 6.Measure the distance from your left temple to your right temple, starting and ending at the hairline. Run the tape around the back of your head,write the number down. 7.Run the tape measure along your hairline from one side of the nape of your neck to the other to establish your nape width.it is call nape of neck measurement. 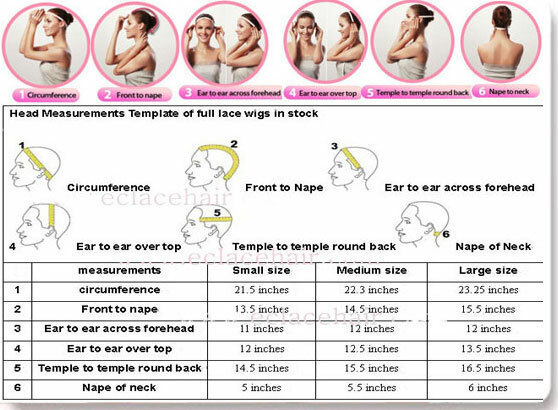 8.Compare your head measurements with that of your lace wig. Ideally, your lace wig will have the exact same measurements as your head. You can control lace wigs that are slightly too big with pins or clips, but it is always best to find a full lace wig of the correct size.lace front wigs cap are stretchable and adjustable,it's better the same size of your head evenif with combs and clips,you can adjust the wig cap smaller when you feel it is still a little big. View next：What is Cap Construction of Mono Top Lace Wigs?